Tippmann introduces the XVR, an enhanced version of the hugely successful Crossover marker. Launched last year, the Crossover appeals more to woodsball players seeking a marker offering the ability to ‘crossover’ into tournament-style play. The new XVR takes Tippmann performance to a new level. The marker was developed based on feedback and suggestions secured by the company from speedball players worldwide. The result is a marker specifically designed to deliver during tournament-style play but still tough enough for woodsball. In the past, players complained about the case in which the Crossover was shipped. I never did understand that complaint since the marker will get scratched the first time you use it. After all it is a Tippmann, a marker designed to be dragged through the mud as you belly crawl 200 yards forward to get that perfect shot. In order to silence the haters, the XVR case is padded with a zipped closure that uses Velcro to secure the marker and barrel. The case is a light weight, simple and intuitive way to store, transport, and protect your marker. When you take the XVR out of the box you notice many features unique to the Crossover including: Flexvalve Technology, 6 electronic firing modes, ability to add front vertical regulator, integrated break beam anti-chop eyes, forged aluminum upper receiver, adjustable clamping feedneck and an internal gas line. Two immediate differences you notice are the two-piece barrel and a vented on/off Air Source Adapter (ASA). I shake my head when I hear players say of the Crossover, “So what, it’s just another spool valve.” No other manufacturer’s marker has the ability to switch from electronic mode to mechanical mode, and back again - on the fly. The Flexvalve feature on the Crossover has kept me in many games and is a feature I honestly don’t know how I played without. If your battery does go down and you have no quick access to a replacement, you don’t have to lose valuable playing time searching for a replacement battery or teching your marker. With the Flexvalve you can keep playing uninterrupted. Teching a marker has never been easier with tool-less access. With the new XVR you need no tools to access either the Flexvalve assembly or the battery; the two most often accessed parts of the marker. Tool-less access will give you even more time on the playing field not in the safe area fiddling with your marker. The XVR also has a little "Bling" factor with the introduction of three different colored markers. The three popular colors of the XVR are red, olive and titanium. The marker has clean contoured lines with streamlined front grip to make the marker lighter and sleeker which is immediately noticeable as soon as you assemble the marker. One feature most players immediately upgrade, regardless of make or model of marker, is the barrel; well not with the XVR. A new feature with this marker is an upgraded, two-piece, high performance, 15 inch barrel. The stock Crossover barrel shoots well, but the new stock two-piece barrel that comes with the XVR is incredibly accurate. Players who want to squeeze even more performance out of the marker Tippmann has a three piece barrel kit specifically engineered to work perfectly with XVR. If you have a gear bag full of old cocker threaded barrel kits, fear not. The XVR comes with a Cocker threaded barrel adapter so you can still use your favourite barrel kit. 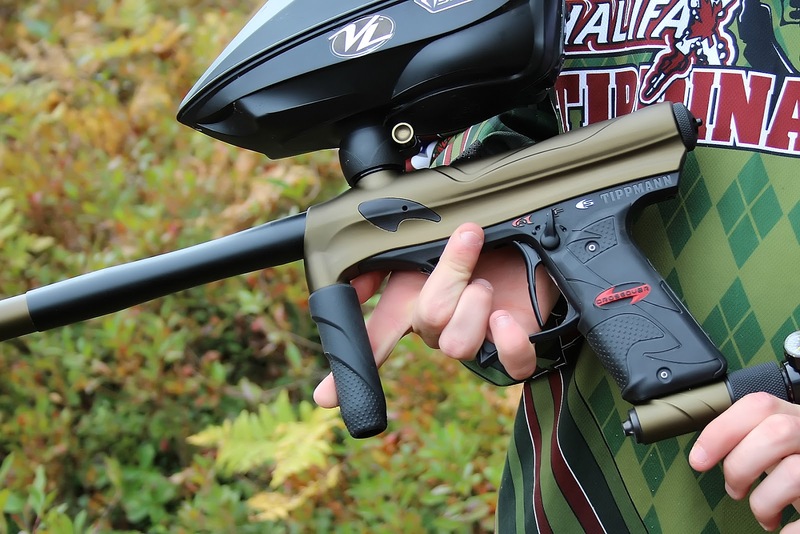 The XVR is a marker proven on the field by Tippmann Effect and Tippinators, upgraded based on player recommendations, with tool-less access, Flexvalve technology and your choice of colors. All this performance is available for an MSRP of only $429. The Tippmann Crossover XVR is dollar for dollar the best value on the market today. If you are like me and want one marker that can do it all you owe it to yourself to pick up a Crossover XVR.